The beginning chain should be a multiple of 20 plus 4. Here is a chart of the first five rows. Row 1: Skip first 4 ch (counts as first dc), **(dc, ch1, dc) in next ch, dc in next 2 ch, ch1, skip 1 ch, dc in next 2 ch, dec (uses next 3 ch), dc in next ch, dec (uses next 3 ch), dc in next 2 ch, ch1, skip 1 ch, dc in next 2 ch, (dc, ch1, dc) in next ch, dc in next ch. Repeat from ** across to end. Turn. Row 2: Ch3 (counts as a dc), skip first dc **(dc, ch1, dc) in next dc, dc in next ch, dc in next dc, ch1, skip 1 dc, dc in next dc, dc in next ch, dec (uses next 3 dc), dc in next dc, dec (uses next 3 dc), dc in next ch, dc in next dc, ch1, skip 1 dc, dc in next dc, dc in next ch, (dc, ch1, dc) in next dc, dc in next dc. Repeat from ** across to end. The last dc will be in the top of the turning chain. Turn. Oh my goodness I absolutely LOVE this!!! thanks so much for the many beautiful patterns!! Your site is bookmarked for life. Can you give me a couple examples of what “light worsted weight cotton” is? Is that like Sugar and cream yarn or?????? Sugar and Cream is a good example. I go by the needle size called for. I’ve seen worsted weights suggest from size 7 to 9, so the ones suggesting 7, like Sugar and cream, I would consider on the lighter side of worsted. I used Knitting Fever King Tut which is a shiny cotton yarn. The shiny cotton is usually mercerized, it has that shiny finish on it and is wonderful and so pretty. I made some soap saver bags with it and it did really great. It does pretty flat appliques too like elegant butterflies and strawberries and such. I highly recommend using it, but not great for kitchen use items. THIS A BEAUTIFUL AFGHAN AND AM GOING TO MAKE IT FOR “BLANKETS FOR BABIES”, AN UNWED MOTHERS PROJECT SOME OF US MAKE AND GIVE TO THEM. By following the directions as written it will make the ripples as pictured. Do you have questions about the pattern? I love this afghan pattern. I have finished my first row. But I am confused on the second row. It mentions dc in dc in parts and in some parts it says “dc in ch”. Is that a typo or am I missing something? lol When you say dc in dc I assum that means through the front and when it says chain through the back loop? It says dc in ch when you are making dc stitches in ch 1 from prior row. The stitches are really made in the chain rather than the ch sp. All stitches are made in the front loop. That is just how I made it. It can certainly be made differently, but would just have a slightly different look. Ok thank you, I was also confused on the in the chain, and if you were going in the front or back loops only. I absolutely love the idea of a scarf from that pattern. I have an idea, but not really a great one. Maybe another reader will have some ideas. I noticed you gave dimensions and ounces needed for one size, 35 x 45, but not the others. What are the dimensions of the other two sizes and how many ounces are needed for them? On my more recent patterns I’ve been putting charts with more detailed information on yarn requirements and sizes. I added one of those charts for this pattern, so it gives ounces and yards for five sizes. Hi! I’m attempting to finish this pattern for my mom by Christmas. I’m confused about how the two rows are supposed to line up. Are they opposite of each other? Meaning that where a v-stitch is on row 2 a dec is on row 3? I just don’t want to get too far into it and have to start over. Thanks! The V-stitches for the “hills” are on either side of a single dc. On the next row, the V-stitches will be in the dc of the prior row V-stitches next to that center single dc. The decreases of the “valleys” are on either side of a single dc. On the next row, the stitch of the decreases that are on either side of that center dc will be in the decreases of the prior row. If that still doesn’t make sense please let me know. Let me know if a chart would be helpful. A chart would be great! Visual aid always seems to help me. Thanks. Gorgeous! Great talent, great taste!! Your patterns are lovely. I have spent a great deal of time searching for a special pattern for an afghan for a special Aunt. Then in one evening I have come across three of yours that I will have a hard time choosing between. I really like your providing information on the amount of yarn needed for various sizes and that you have done this one in cotton as I have been experimenting with it and really like the results. Thank you for sharing these beautiful patterns. i love the ripple afgghan , i am ready to make for my grand child that will love to have it like hi says. Thank you so much for the pattern. I have always liked the smoother ripple look but was unaware as to how to accomplish it. THIS IS IT!!! thank you again. well, I just saw this design on a email place that sends me stuff often (name? sorry I am totally illiterate when it comes to computers) and liked the small photo they showed so I clicked to get the pattern. should have known it was YOURS !!!! I am not a whizz at crochet and most of the time I have my small (2 and 3) grandchildren and my husband (old enough to know far better!) swirling around demanding I drop whatever I am doing and pay attention to their needs. really complicated stuff is far beyond me. your patterns are LOVELY, work quickly, and you have always helped me to understand them if I cannot do it alone. I might not even try this if it was from Bernat or one of the others I too often find are incomprehensible, but coming from Mama, well, I’m off to the store for yarn! THANK YOU, ALWAYS !!!!! I LOVE all the detailed information you give, like the number of CO sts for various finished sizes and the amount of yarn needed. Your patterns are beautiful and very clear. Thank you so much! It is the back loop of the first row. When working the second row, since you turn the work, you are actually working in the front loop since it is the back of the first row. Thanks so much The only reason I asked is I really like the “line” it creates. I love the Eyelet Ripple Afghan pattern; however, despite being considered easy, it is ony the second afghan I am attempting with the instructions – “the beginning chain should be a multiple of 20 plus 4.” I have found all different explanations – can you explain this to me? Thank you. After that I give the number of beginning chains needed to get different widths. I give the multiple of 20 plus 4 so that if the five sizes I provide aren’t sufficient, it can be adjusted to make other widths. The smallest width I give uses a beginning chain of 164. It will have 8 repeats of the pattern. In this case, the multiple is 8. 8 multiplied by 20 is 160. Add 4 and that give the 164 beginning chains. Hi thanks for you help I ve been trying to a wavy pattern for a couple of weeks without any success. I dont no how many times I have pulled it out. But thanks to your drawing I can see what Im doing. I have also booked marked your page. having trouble with getting first row done, does this row end in full pattern for some reason I keep coming up with one stitch left, really want to make this but for some unknown reason keep coming up with at least one stitch left, no idea what am doing wrong. Make sure you have the right number of chains to begin and that your first set of stitches are in the 5th chain from the hook. Then each repeat takes 20 chains and should work out. In this blanket, on the second row and so forth, all the chain stitches from the previous row will have dc stitches made into them, so when instructed to dc in the next dc, it should always be the next stitch as you are working along. The dc to skip is the last dc of row 1. So you are correct that the v-stitch is made in the next to last dc of row 2 (which is the second dc of the v-stitch). There is also a chart at the bottom that might help illustrate it. Love your patterns!!!!! Found one in allfreecrochet, then saw your patterns!!!! Now I can’t decide which on I want to make for a wedding present, but this one is at the top of the list. I’ve never made an afghan with cotton before and this might be perfect!!! Can hardly wait to go to town next week and look at the yarns a cotton available!!!! The extra small size is a great crib sized baby blanket. It begins with 164 chains. I am so thankful I found your site/blog. You are a dear for such easy to follow directions and even when help is needed, your explanations are detailed and easy to follow. Thanks for the beautiful eyelet ripple pattern. I am ordering my yarn to get started and I just can’t wait to start!! I’ve never used cotton. How thin is it? and also, is it warm? Cotton comes in different weights just like the other fiber types. Cotton of a given yarn weight would be a similar thickness or thinness to other fibers of that weight. To me cotton is as warm as man-made fibers. The animal fibers are definitely warmest. Cotton is a good deal heavier than man-made fibers, so a full sized blanket of cotton would be very heavy. One more question, would it look the same with acrylic yarn? This is a very shiny cotton, so likely not unless you found an acrylic that had a really good sheen. Thank you for these simple instructions and pattern! Very beautiful. I’m new at crochet and I’m excited to try this one. Thank you for sharing your pretty pattern! I am a beginner and this is my first afghan. I have just finished Row 1. I am puzzled that the beginning and ending don’t match. Is that o.k.? I have gone over and over it and can’t find a mistake but I am a little nervous to start Row 2. Also, I have just read the comments but I don’t understand. Was I supposed to make Row 1 in the BLO? I don’t see it in the directions. Do I need to take out Row 1 and do BLO? Then Row 2 is FLO? So then each time I turn, do I alternate between BLO & FLO? Thank you so much! The beginning and ending should match. When you repeat the section between the **, it should end at the end of that section on the last chain. One or two loops is personal preference. Mine was done with one loop which leaves a little ridge every other row that accentuates the ripple. For working the first row into the chain, one or two loops doesn’t matter because it will make no material difference in the look of it. If you do decide you want the little ridge, BLO or FLO depends on how you are using the terms. At the end of each row, you turn the work to work the next row. As I was looking at the back of the prior row, I worked in the front loops as I was looking at it. This is the back loop of that prior row if you were to look at it as it had been made. I re-did Row 1. It came out right! Thank you for your help! Thank You So Much…On top of this pattern being so beautiful it is the most complete description of a pattern I have seen. You gave all the information one could ask for. Again thank you so much for a fine pattern. I’m trying to work this pattern, got to the end of row 1 and have 10 remaining stitches. These obviously won’t be enough to work the row 1 pattern again. Do I just follow the pattern as far as I can then stop? When I went back and started rereading the instructions, you mention that each size is multiples of 20 plus 4. With 20 in mind, I’ve counted and recounted the number of stitches in row 1 and row 2 and both come up with 22 (excluding skipping the first 4). If the repeating patten is 22 stitches then they don’t come out even with the 200 (plus 4) stitches I originally started with. Am I reading this right? I don’t want to go any further if I’ve done something wrong. Thanks for your help. just wondering if this pattern looks familiar to you? I can’t find it anywhere…I love the gentle ripples and lacey look to it…thank you! I have never seen it, but it is gorgeous! I looked every way I could think to look on Ravelry and couldn’t find it. It is a good enough picture that I could make a pretty good guess at the pattern. I’m sorry I couldn’t find it. Found it! In the Chrome browser, if you right click on the image and tell it to search Google for the image, it can turn up some good results. I found it on this blog – Patty Crochete but it’s in French. A quick run through Google Translator (I sound like a commercial now!) yields the translation. Whether or not the instructions are easy to follow, she has good pictures to go with it, so we can give it a go. PS Wanted to add, not only are your patterns lovely, but you are so kind and thorough in answering our questions. as I look at her tutorial, I think it would even look nice to just use her pattern as an unusual edging to a “plain” ripple blanket. Of course, with Crochet, options are endless! HA! Are you tired of me yet?! Totally random search for blanket ideas turned up this stitch which is also very similar – just without the wave part! Cool beans! You can definitely make it in chunky yarn, I would just recommend using the hook size recommended on the yarn. It will be much larger than the sizes I give in the cart, so start with a chain for a smaller size. So lovely! My mom did something similar for my son 43 years ago, knitted in a light white acrylic. It’s a treasure. What a wonderful way to share those patterns, thank you for doing this. I’ve never made a baby blanket out of 100% cotton. Won’t it shrink when washed? Thanks for your help. It depends on the cotton. Prewashed cotton shouldn’t shrink at all unless perhaps you wash in hot water or dry in a hot dryer. Kitchen style cotton yarns can shrink a little. This pattern is just beautiful. I would like to make a gauge test piece that will allow me to get comfortable with the stitch pattern. How make stitches would you recommend. Thanks for you help, this will be my first detailed project. I have mostly made simple repeat stich patterns. Wish me luck…….. I know you will do great. For one ripple for your sample, start with 24 chains. For a two ripple sample, start with 44. Lovely–I like how to make various sizes. I have taken this pattern apart three times now and I get the first row but it ends with chain, dec (uses next 3 ch), dc in next ch,the last group. I have counted and recounted my chain Help me please the second row is difficult for me. Your beginning chain should be some multiple of 20 plus 4 chains. The 4 chains are at the beginning of the first row, then each repeat should use 20 chains so that the last repeat ends on the last chain. If it is not ending like that, check that each of your repeats is using 20 chains. I am in Australia and I have been deperately trying to find out what worsted wool is.We don’t have that here.We don’t have sugar and cream here.If I go with the size of the hook to the size of the wool (we have ply.like 4 ply or 8 ply) will this work? This afghan can really be made in any weight yarn. Do exactly as you say, and just match hook to yarn. The rows stagger by 2 stitches since it is a ripple. But the rows should line up at the stitches that are the center of each peak and each valley. Hi! Love your site and patterns! I’m on dialysis 3 times a week and am trying my best learning how to crochet with out moving my left arm (it’s the one hooked up). I’m a stubborn soul so with practice it will be done! My big question is… I bought out the clearance at the craft store of the Mosaic yarn by Bernet. Beautiful yarn! I do find it is a thinner yarn. Would it work with this pattern? If not do you have an easy pattern it would work with you could suggest? That will work fine for this pattern. It won’t look exactly like my example because I made mine in a very even yarn with a luster, but the Mosaic will make a beautiful blanket. If you do 224 stitches for the ripple afghan after frst row how many stitches do have on needle then after second row how many stitches left on needle. I understand there is twenty stitches for the pattern repeate. Please help having trouble getting pattern to be consistent. Starting with 224 chains, each row will have 221 stitches. This includes counting the turning chain as one dc stitch and counting the chain stitches between dc stitches. I can hardly wait to try this pattern. I make lapgans for chemo patients (give them away for free) and just received a donation of some HUGE cones of silky weaving yarn. should work up nicely for my purposes. thanks. I came up with this on my own, so I don’t know of any other names of it. 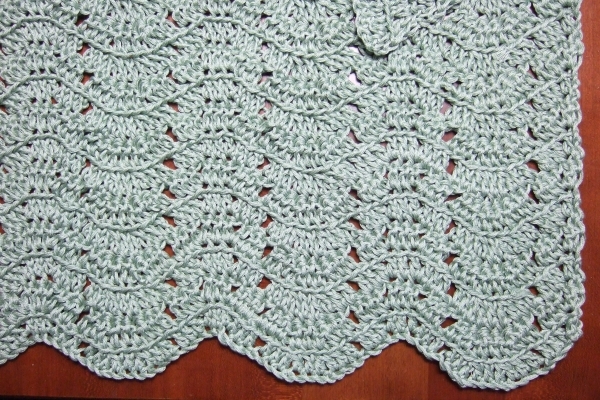 The technique of alternating ch stitches and dc stitches to create lacy gaps is like filet crochet. Could this be made using the no beginning chain technique? Between my arthritis, diminishing eyesight, and ADD (attention span of a gnat), counting chain stitches has made me all but give up crocheting. I swear I could count 100 times over, and get 100 different counts. This pattern is lovely, and I would like to give it a try, but fear the initial 204 chain stitches would do me in! This is a beautiful stitch and I am trying to make a baby blanket. I have started 3 times and cannot get the stitches on the 2nd row to end same as diagram. Then when I start the 3rd row it doesn’t mesh right. I have checked the work, counted stitches, marked beginnings, but still it won’t come out right. I don’t want to abandon bc this really is beautiful! What should I do? If you could send me a photo, that would really help me diagnose the problem. I love this pattern but i am so confused about what to do at the sides. mine are not straight and even though the patteren works out i am running off to one side. im not that familiar with a ripple but how do the sides end up even if the pattern sifts? is there any way you could chart this up or5 rows so i could see how this works out? Here is a chart of five rows. I hope this helps explain. I just love your site….thank you so very much for all the beautiful patterns. I am about ready to start this afghan…just LOVE it!! I have been experimenting with yarn and needle sizes. I wanted to get exactly what you used but the store around here don’t carry King Tut. I ended up with a cotton yarn from Hobby Lobby that I am unsure about. It appears to look much better when I do a test swatch using a size 4 crochet needle…much easier to work with. The needle recommended…a 5 or a 5.50 was loose and didn’t crochet easy. I guess my question is would I be wrong to go with the size 4 needle even though it is not recommended? I have a size 4.75 needle (I think it was) I might test also. I know this is long and you don’t know this cotton yarn I bought. I am a relatively new crocheter (word? )…but I have done two afghans and several scarfs by pattern in the last few months. I am having a wonderful time getting into crocheting. Oh…by the way….my test swatch of 20 plus 4 looks great so I am READY TO GO!!!! Now if I can just decide on needle. The size 4 swatch is almost the size of a swatch I did using the size 5 needle…can’t figure that out. Again….I appreciate reading all the comments to others…it has helped me so much. Thank you!!!!!! Use the size hook that you think produces the best results. Cotton can have different qualities than wools and acrylics as well, so you will need to experiment with hook sizes when you use different fiber types. I’d say if you are happy with your swatch, then just go for it! I finished this eyelet lace afghan and I am soooo very proud of it. It is beautiful! Just love this site so much. Thank you for the free patterens…Also the other one’s as will.. Thank you so very much for all these beautiful FREE patterns! The only problem I’m having is that no matter what I do, I can’t get the end of the rows to be straight…. I’m concerned that it’s going to be wider & wider as I continue in. Please help…. I made this for my nephew’s wedding gift in cream. Very nice and easy! Thanks. Going to try another of your patterns for another gift. Love your site. also…I found your sizing chart to be VERY helpful!! Your patterns are absolutely lovely! I have downloaded several of them, then I have a difficult time deciding which I want to make. This one is particularly beautiful. I can’t wait to start it. Thank you so much for generously sharing your beautiful creations with us! Is there a way for you to make a video of this blanket. I seem to do better watching instead of reading the instructions. I don’t currently have a good setup for making videos. I have this one on my list to do in the future. Could you explain the row 2 sc in sc and sc in chain. I still don’t get it. I’m a beginner. Please help. Thanks. I assume you mean dc instead of sc. There are no sc in this pattern. In the instructions to try to be more clear about where to make stitches and where to skip stitches I am saying specifics of what stitches you are working in from the prior row rather than just saying “next stitch”. I have it on my to-do list to make a video but it will be a couple of months until I can get to it. Have you looked at the chart? It can give you a visual of how it lines up. i like this pattern. My big comment is how nicely it is laid out to print. Thank you. I plan on making this in solid color and my daughter would like fringe added. I’ve done this with another ripple pattern and fringe is on each lower point. Wonder if you could advise me on the beginning chain on how to add an open spot for attachment. Row 1: Skip first 4 ch (counts as first dc), **(dc, ch1, dc) in next ch, dc in next 2 ch, ch1, skip 1 ch, dc in next 2 ch, dec (uses next 3 ch), skip next ch, ch 1, dec (uses next 3 ch), dc in next 2 ch, ch1, skip 1 ch, dc in next 2 ch, (dc, ch1, dc) in next ch, dc in next ch. Repeat from ** across to end. Turn. Row 2: Ch3 (counts as a dc), skip first dc **(dc, ch1, dc) in next dc, dc in next ch, dc in next dc, ch1, skip 1 dc, dc in next dc, dc in next ch, dec (uses next 3 dc), dc in next ch, dec (uses next 3 dc), dc in next ch, dc in next dc, ch1, skip 1 dc, dc in next dc, dc in next ch, (dc, ch1, dc) in next dc, dc in next dc. Repeat from ** across to end. The last dc will be in the top of the turning chain. Turn. After that use the original row 2 of the pattern. This is a beautiful pattern, thank you. In the description the DEC stitches states to skip a chain. However in the directions it states to use 3 chains. What am I not getting? Using 3 chains just meaning that the stitch includes those three chains. You skip the middle one.